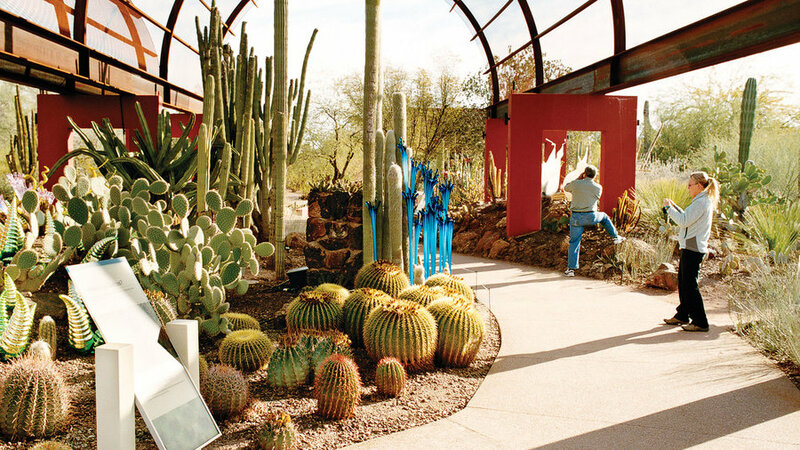 Step into our favorite spots for nature lovers in the outdoor gardens of Phoenix. Why go in spring: Explore Phoenix’s cutting-edge gardens and open spaces before summer heat sends you indoors. Dress code: Pearl-button cowboy shirt, jeans, and sunglasses. 22 feet: The height of the tallest cactus in the Cactus and Succulent Galleries at the Desert Botanical Garden. Rakish find: Pick up a stylish collapsible rake at Southwest Gardener (2809 N. 15th Ave.; 877/315-9301). Bragging rights: Pizzeria Bianco ($; closed Sun; 623 E. Adams St.; ), where locals line up for wood-fired pizzas topped with house-smoked mozzarella. Best places for nature lovers: The Rio Salado Habitat Restoration Area (free; Central Ave. just south of I-17; ), a 5-mile stretch of wetlands along the Salt River bed. Once a dump site, it’s now home to hundreds of bird species. Also: The habitat’s eco-friendly Audubon Center (). Browse this beloved Phoenix institution for hard-to-find plants; the nursery’s rose and citrus stock is particularly diverse. 3414 N. 40th St.; 602/955-4500. It’s easy to eat green at this sunny, airy restaurant―alternative medicine guru Dr. Andrew Weil helped create the healthy-but-sophisticated menu. Sip organic Sauvignon Blanc and try the miso-glazed black cod or green tea soba noodles with peas, bok choy, and lemongrass. $$; in Bittmore Fashion Park, 2502 E. Camelback Rd., Ste. 135; 602/774-3488.